Earthbag Building : The Lowest Cost, Most Durable Building System? The military have been building strong, durable bunkers and structures with earthbags (sandbags) for about 100 years. Earthbag building is as simple as filling bags with soil or other appropriate fill material, stacking them and tamping the courses solid. This same building method is now being used to construct ultra low-cost structures the world over, including houses, orphanages, schools, shops and many other types of buildings. 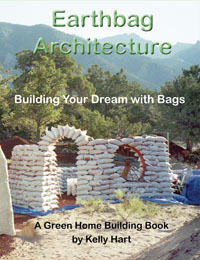 While other earth building methods such as adobe are competitive price wise, I am not aware of any building system that is as low cost and durable as earthbag building. For instance, earthbag buildings are more earthquake, hurricane and flood resistant than adobe buildings. Every building system has pros and cons, but building with earthbags may be the lowest cost and most durable. Let's look at the materials required to build a small $100 earthbag dome. - Recycled or misprinted bags: Polypropylene bags are widely used for rice, sugar, fertilizer, animal feed, cement, plaster and other uses. It's easy to find used bags at very low cost or even free, or you can order misprinted bags from a manufacturer. Burlap bags are another option if you can get them cheaply. - Subsoil: This is often available at or near the construction site. Some builders build below grade to reap the benefits of an earth-sheltered home. You can typically use soil from the excavation process as fill material in the bags. In addition, excavating companies frequently have excess 'fill dirt' they'll gladly sell for cheap. Clayey soils can be mixed with sand from a stream or river bed (often available free for the hauling). Another source is sand and gravel producers, who often have 'reject fines' or 'road base' at very low cost. - Gravel: This is a good fill material for lower courses and can serve as a low-cost foundation. Gravel also makes a good rubble trench foundation for under the first row of bags. - Tamped earth floors and earth plaster: Experiment with your local soil and find a mix that is suitable. If it shrinks and cracks excessively, add sand. If it doesn't adhere well, add clay. Earth plaster can become a work of art, with almost any color imaginable. Your floor could be made simply by tamping the mineral subsoil that's under the dome, although in most climates it's advantageous to add insulation under the earth floor (such as scoria or pumice). - Doors, windows and vents: These can all be salvaged. Short pieces of pipe can be buried in the wall for ventilation. Insert some pipes low in the wall and some up high for optimum ventilation. Many builders add vented or openable skylights in the peak. Arched window and door openings can be formed from barrels, tires or forms built of wood scraps. Consider using old wagon wheels or culvert pipe for windows. - Exterior plaster or living roof: Unless you're living in an extremely dry desert, you'll need to protect your structure from moisture damage. There are numerous options. Some builders used a soil cement mix to create a reptilian-like scaled surface. Some use lime, cement plaster, or even papercrete. Another way is to put 6 mil poly sheeting and earth over the dome and create a living roof with plants. Living roofs are very beautiful, but keep in mind they require a lot of time and effort, and a favorable climate.